This Mother’s Day, if I could make one request, it would be this: one of my childhood friends, a girl who peppers most of the happiest memories of my youth, needs something, I’d like to help deliver it to her. We fell out of touch as people do, and then reconnected through Facebook. I’ve often chuckled at her pictures, her three rough and tumble boys a stark contrast against my three squealing, boa-loving girls. She in Oklahoma, me in Upstate NY, both so very far from Eugene, Oregon. During movie time in school we used to take her Swatch watch and take turns running it up and down one another’s forearm to pass the time. The watch smelled funny, rubbery and sweaty, and the motion tickled. We’d play together, all knees and elbows. She became a serious distance runner, I ran hurdles. We drifted apart, but I think we always kept a little seedling of our friendship going. At least I did. Finding her again was the tenderest of gifts. Not long ago it became clear that something serious was amiss with her youngest boy, Ransom. His eyes are so big, and while his face is not a carbon copy of hers, the wide open kindness that I remember of Aimee leaps from the screen each time I see him. I reel from the awesome reality that she has children, that she made more Aimees, boy versions though they may be. I don’t anticipate any trips to Oklahoma and I am not on the reunion lists for the Eugene schools after having moved in 8th grade. So we have Facebook. Many of our friends have very graciously been praying for and thinking about Ransom throughout these last several months. A big thank you to all of you! This SUNDAY (MAY 13) we would like to ask anyone who can to pray a Novena for Ransom’s healing. For anyone unfamiliar with a Novena, it is simply a prayer that is prayed for 9 consecutive days. We are asking those participating to pray through Psalm 20 and ask for Ransom’s healing. If there is anyone that you know that might be willing to participate we welcome any and all prayers. I will post more later, I just wanted to give anyone interested a heads up. Thanks so much. PS He’s still in the hospital and will probably be there at least through the weekend. His levels are very low (nearing zero) and so it’s hard for his body to fight infection. Hopefully they will start going up tomorrow. 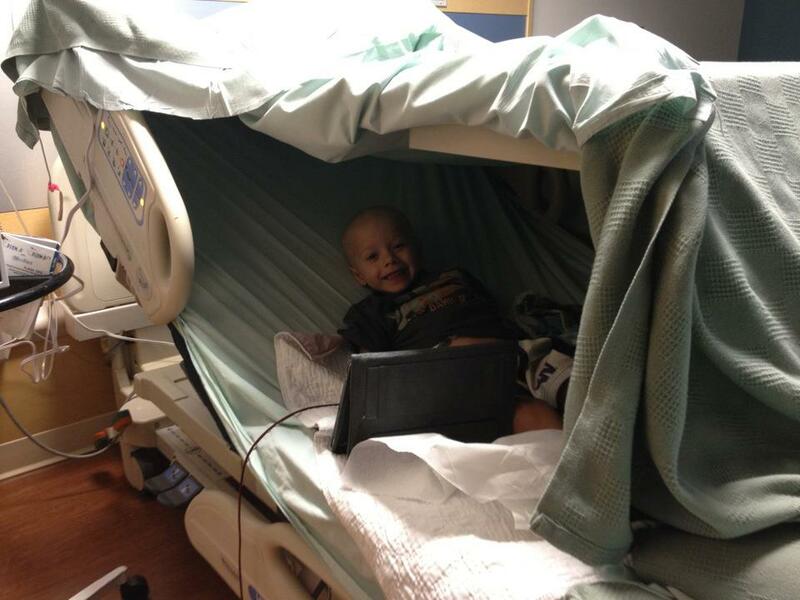 Her son Ransom is in the OU Children’s Hospital and has been diagnosed with a rare form of cancer for someone his age. He has two older brothers and a face that will make you melt. I can’t quite wrap my mind around how he is just that kid your eyes would follow on the playground—the eyes a little twinklier, the smile a little wider, all in all irresistible in a way that just makes you feel happier. Aimee was like that, maybe a little more timid. Maybe he is too. She has used words like neutropenia and she has talked about the second round of chemo being harder than the first. I get overwhelmed by the details and the gravity of it all, but when she made her request I thought I had finally found something to latch on to. A way through, or at least to—a way to send her love, energy and the swelling of support I know lives in this blogging community. I am writing to ask you to help Aimee and Ransom and the rest of their family. I believe I have eliminated all the hurdles of commenting. No need for a blog. No need for an email adress. No need for a real name. I am just asking that you leave words of encouragement, however they come to you, that I can direct her to. Maybe it can diffuse some tiny measure of her anguish and give Ransom a little boost. It is, as a mom, my only wish. I cannot even imagine your pain and fear right now. As an adult, cancer is hard enough; in a child, it’s unthinkable. Ransom is adorable, even in the face of such adversity. I’m praying and sending good thoughts and magic healing vibes from Michigan. Peace and love and pain free moments for all of you. As the mom of a 6yo kiddo with multiple medical special needs, we know what hospital stays, stress, fear and pain are like, but I cannot imagine fighting cancer with one so little. Praying and sending love and peace your way. This means so much, thank you. I am sure it’s making it way to OK. Thanks! I cannot imagine. My heart goes out to you. I wish you peace and love. A prayer has been said and may your little one be home soon. This means a lot, Peggy. Thank you. Thoughts and prayers go out to Aimee and Ransom and their entire family. Sending you strength, love, and light. Ransom is a beautiful boy. Happy Mother’s Day, mama. Oh, Sarah, thank you so much. Sending prayers and positive energy to Ransom and his family. Fight hard little man. Maybe it’s because I’m a mom. Maybe it’s because I, too, have three boys. Maybe it’s because I’m finally at a point in my life where I realized just how lucky I am. Maybe it’s just because I’m human. For whatever reason–and even though I don’t know Aimee and her boy–I’ll be praying a Novena. May you all have healing. I whatever way it comes. Maybe it’s because you are wonderful. I would love a cool fort like that, little man. You look positively snuggly and warm and happy. You are loved, Ransom. So many people care about you and your family. People you know, and more than a few that you don’t. You’ve never met me, for instance. And yet, I know you still. In a way that is meaningful and real. And though I’ve never played Legos with you or read you a book or chased you around the playground as you giggled because you doused me with a Super Soaker, I know that we’d get along just fine. You and me? We’d be buds. So here’s the thing: You are a handsome young man. You are awesome in so many ways. And you are loved. Close your eyes. Feel the embrace. The peck on the cheek. You are so very loved . . . I do not know if prayer changes things, but I very strongly believe that prayer changes people. For through prayer, we pause for a time and think of others. We consider the situations and circumstances of another human being and lend them what hope we can spare. So I will pray for you. I will not just say a bunch of words, but I will seek to feel your pain. Your heartache. I will taste the tears. And I will smile as I imagine the hope that surges with every beat of your heart. Hold him. Be held by him. Allow others to care for you as you’ve cared for others. And let no thoughts of regret enter your mind. You have this moment. It’s right here. Embrace it. Don’t look back or crane your neck toward the clouded tomorrow. Be here now. I wish this for you, Aimee . . . Thank you Kristen. Hope your littles laughed! Sending all my love and warmest thoughts…. Thank you everyone for your kindness toward us. It is comforting and inspiring to read through all of these comments. Thank you so very much. Ransom, sweet soul, beautiful spirit, unforgettable boy.